Ron Newman has been fishing since he was two years old. He was born in Michigan and raised in Arizona. He obtained a Bachelor of Science degree from Northern Arizona University and then moved to British Columbia where he worked for the BC Forest Service. In 1971, Ron was extremely fortunate when his job took him to Kamloops and placed him right in the middle of a world-class fly fishery. By 1973, he had discarded other forms of angling to pursue the famous Kamloops Trout with a fly rod. Ron Newman has spent 30 years researching virtually anything that could affect the Kamloops rainbow trout and how they act in stillwater. Learn his inside information that will help you to catch more trout in stillwaters. As Ron was just beginning to fly fish, he began keeping detailed records of each fishing trip so that he could fish the same hatches in subsequent years. His computer now holds more than 970 detailed records of fishing trips. He has analyzed that data to determine how such things as weather conditions, water conditions, moon position, fish and bug activity, and numerous other factors might affect his fishing success. His studies also led to numerous questions about the bugs, the lakes, and especially the Rainbow trout. Ron has now invested more than 30 years finding the answers to questions such as; how well do Rainbow trout see, hear and smell. Or, how important is color to the angler and what is the lateral line used for? As Ron became proficient at the sport, he began to write articles for newspapers, magazines and the internet. He has provided fly casting and fly tying lessons as well as lectures on entomology, limnology and ichthyology. Ron has been a member of the Kamloops Fly Fishers Association and the BC Federation of Fly Fishers since 1974. After all the years of research and data analysis, Ron finally wrote a book to pass along this information to other anglers. 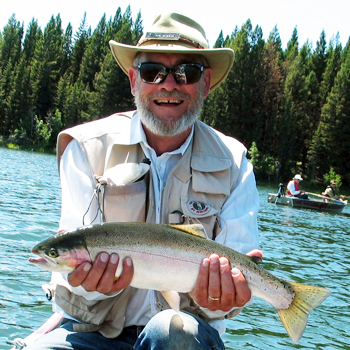 His book is entitled “Rainbow Trout Fly Fishing – A Guide for Still Waters”. It is directed at the intermediate to advanced angler who wants more than a new fly pattern or an interesting fishing story. The book was released in 2008 by Frank Amato Publications.